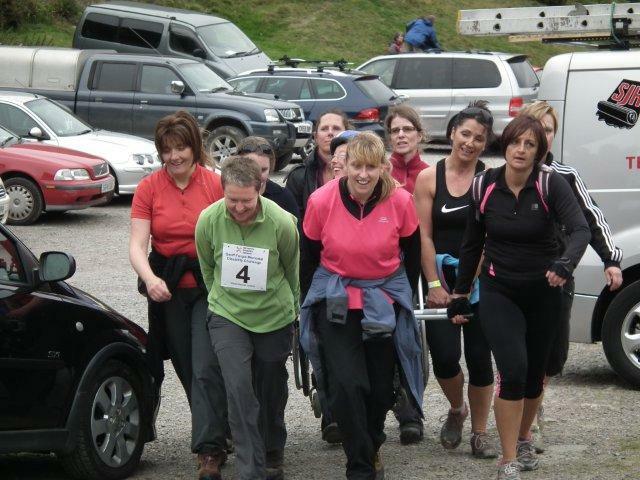 SDN were delighted to be yet again blessed with good weather for the Disability Challenge last Sunday, September 16th. Many of you will recall last year when we did the Walk & Roll in Shrewsbury Quarry the weather came good just when we needed it! Any walkers at Carding Mill Valley on Sunday may have been surprised to see a large white marquee erected and to the side a green First Aid tent hosting qualified First Aiders, all ready in the event of mishaps. A large number of people were busying themselves with either fixing frames to wheelchairs, setting up a refreshment area for our volunteers or putting SDN information stands up. At various locations along the route there were Marshals, who as well as Raynet, were able to keep contact with one another as well as those at base so all would be kept informed on what was going on. 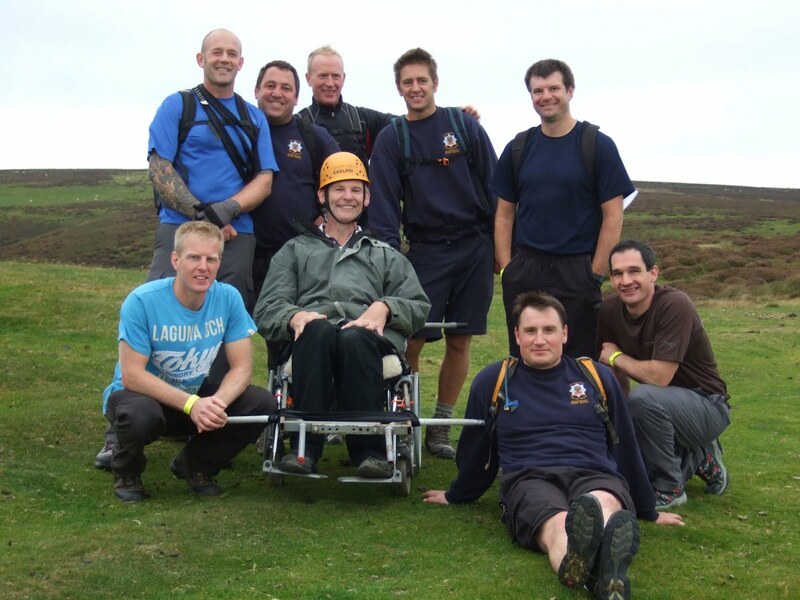 Dave’s team soon expanded as at 9am the first team “Shropshire Fire & Friends” arrived to carry pioneer Daisy Nash (Olympic Torch Bearer 2012) as far as Pole Bank, which is the highest point on the Long Mynd, before looping round and returning to base via The Burway. One of the first pioneers to arrive was Debbie Brennan, Paralympian Gold Medallist from Sydney 2000. Debbie brought along her racing chair together with her gold medal. Many people talked with Debbie about her experience and were delighted to be photographed with Debbie and her medals. Debbie was pioneer for team “West Mercia Ladies”. Daisy Nash from Telford who was Olympic Torch Bearer in Kidderminster on 24th May 2012 brought her torch along enabling people a rare opportunity to hold an Olympic Torch and be photographed with her and Debbie. Sue Forgie, wife of the late Geoff Forgie, together with Debbie Brennan & Sonia Roberts, Chair of SDN, officially started the event at 10am with Team 1 “Shropshire Fire & Friends” setting off on their journey. Teams set off on the challenge at about 15 minute intervals, this gave space to each team. 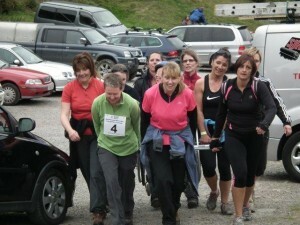 Time went very quickly as it was soon time for “The West Mercia Wheezers” to set off with their pioneer Ruth Fairclough. Although the skies started to cloud over, everyone was so happy talking, and mingling with each other. It was amazing how many walkers and dogs were around on this Sunday morning and it was good to have chat to some. Our own supporters, to the delight of dog lovers brought their canines along to be fussed and be part of the action. We did not expect the first team to be back until after 1pm as it was expected the Challenge would take between 3 and 3 ½ hours. To our surprise teams arrived home earlier than expected. Debbie Brennan pioneer for “West Mercia Ladies” were the next team to set off, soon to be followed by “Team GDF” (Geoff David Forgie) Jess Forgie, Geoff’s daughter was team leader with SDN member Hilary Fisher being pioneer. 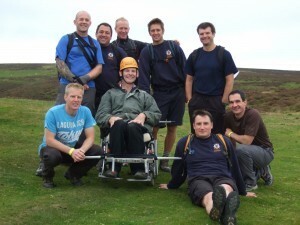 “Bridgnorth Aluminium” realised a dream come true for Will Martin by carrying Will in his wheelchair over the course. Last team to go was “White Watch Shrewsbury” with pioneer Alan Townsend (SDN member) Alan said prior to the event “to be carried like this I will feel like a king” anyone looking at the returning photographs will see Alan return in style-Like a King! Sue Forgie said “Geoff would be really proud of this. He loved enabling people with mobility problems to get to places they would not normally go. For the first year, the size of the event was just right. 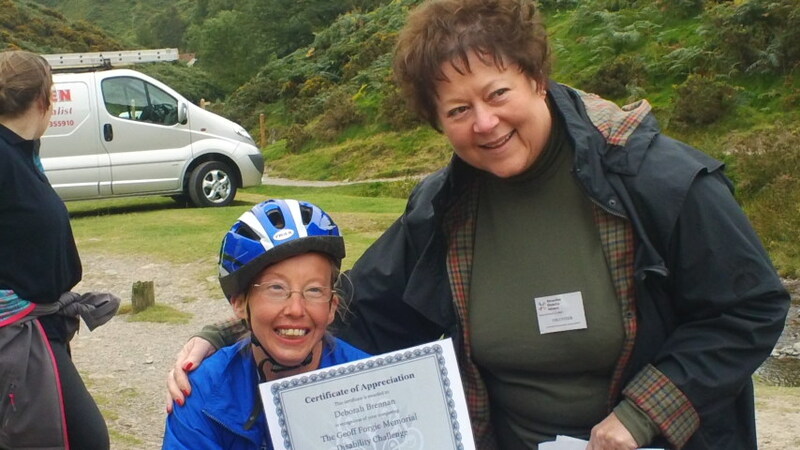 It has been a really good day, no mishaps, all has gone well….” Sue, as each team returned to base, presented each pioneer with a certificate acknowledging their participation. Everyone was smiling and laughing, eager to tell those back at base what a wonderful adventure it had been. A welcome cup of soup and roll together with tea, coffee and water was most welcome by many people. We were delighted that our own amazing grace Grace Hough who blogged so well for us from the Paralympics London 2012 came to support us in the afternoon. It was good to talk more about her adventure and what She hopes to do in the future. Thank you to all teams, volunteers, pioneers and to Dave Hewetson for being lead in organising this event. Thank you to all our sponsors, and anyone involved in making the first Geoff Forgie Memorial Disability Challenge happen. A big thank you to all who have been involved in any way, there are too many people to mention individually by name. This entry was posted in Blog on September 24, 2012 by Clear.